Excel allows you to sort cells in alphabetical order. To achieve this, we will use normal and custom sort. 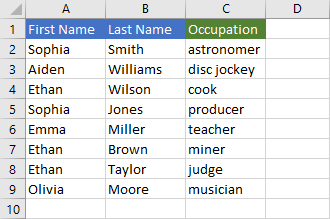 In the following example, we have a list of people, with their names and occupations. 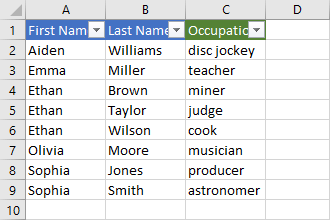 Remove all leading spaces from your data before trying to alphabetize data. Let’s sort them alphabetically by the first name. 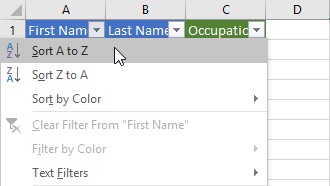 Click any cell in column A, then go to HOME >> Editing >> Sort & Filter >> Sort A to Z. Instead of using the Ribbon, you can use filters. To turn on the filter go to HOME >> Editing >> Sort & Filter >> Filter. You can also use the Ctrl + Shift + L keyboard shortcut. Little buttons with arrows are added to headers. Now, you can just click an arrow and the sort option will be available. To turn off filter use Ctrl + Shift + L again. Now, the data is alphabetized by “First Name”, but “Last Name” is not sorted. To deal with this, we will use Excel feature called Custom Sort. Click any cell with data and choose HOME >> Editing >> Sort & Filter >> Custom Sort …. First, Excel will check first names. 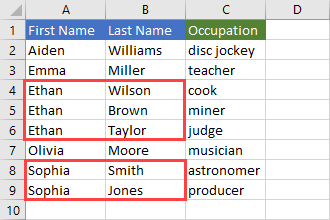 If the names are identical, then Excel look at the “Last Name”. The example below shows the result.